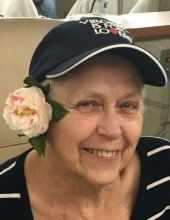 MANNING – Frances Elizabeth Lowder, 67, died Sunday, January 27, 2019, at her home surrounded by her family. Born May 9, 1951, in Manning, she was a daughter of the late David Thomas Lowder and the late Julia Eliza Rhodus Lowder. She was an artist. She is survived by her special companion, Lester Haley, Sr. of Manning; two daughters, Sherri Morris of Manning and Miranda Tisdale of Danville, Virginia; a son, Ozzie Tisdale of Manning; two grandsons, Clay Morris and Henry Morris; four great grandchildren; a brother, Henry Edward Lowder (Margie) of Manning; three sisters, Dora Jane Richburg of Manning, Sylvia Fields of Pelion and Susie Way (Jim) of Pinewood; special niece, Annette Miller of Andrews; and several beloved nieces and nephews. A memorial service will be held at 2 p.m. on Wednesday, January 30, 2019, at the residence, 1200 Marlowe Drive, Manning. In lieu of flowers, please send memorials to the American Cancer Society, 128 Stonemark Lane, Columbia, SC 29210. The family would like to give a special thank you to Agape Hospice for all of their loving care and attention. To send flowers or a remembrance gift to the family of Frances Elizabeth Lowder, please visit our Tribute Store. "Email Address" would like to share the life celebration of Frances Elizabeth Lowder. Click on the "link" to go to share a favorite memory or leave a condolence message for the family.